In today's music industry, the gimmick of choice is the interactive CD. Along with the two hits and ten pieces of crap that constitute an album these days, the artists can add photos, movies and other bits of memorabilia for the rabid fans to drool over. But this is hardly new. In the late 1970s, the recording industry created the forgotten archetype: the interactive eight-track. From its conception in 1965, the eight-track was the music format of choice for the automotive industry. Yet in 1977, the eight-track was knocked off its throne by the cassette. Eight-track distributors were desperate to reclaim its role. But how? Along came the Atari 2600. Suddenly, the eight-track industry saw a way that they could pass the cassette, by including Atari games based on the artists or songs on the eight-track. The interactive eight-track was born. The interactive 8-track looked like the average 8-track, except at the bottom, where the Atari cartridge was connected. These 8-tracks, or "double-enders" as the music/video game fanatics called them, were an instant success and proceeded to change the music industry for at least a couple of weeks. Like most technical and philosophical breakthroughs in the 1970s, the double-enders were ushered in by the most gifted and savvy group of the decade: Foghat. 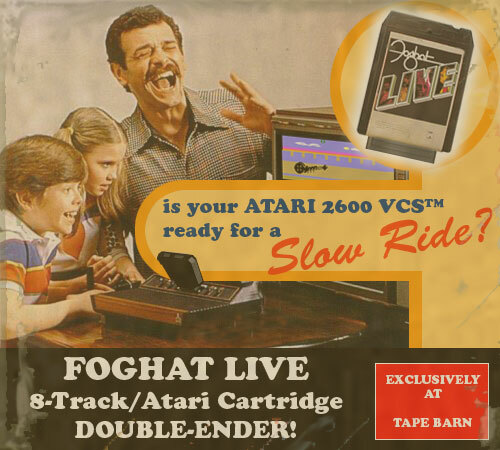 When the Foghat Live double-ender hit the market, most people didn't know that they were looking at the new face of interactive music. The album was a tour-de-force of classic Foghat tunes, but what really "turned this up to 11" was the inclusion of the "Slow Ride" game. In "Slow Ride," two players faced off in an anti-drag race; whichever player finished the race in the worst time was the "Slow Rider" and won the game. The double-ender was a hit. Magazines like Rolling Stone and Gamers Monthly hailed the Foghat Live 8-track as the start of the new music and video game revolution. And it was, for the next four years at least, but in the end it was not enough to save the interactive 8-track from the trash heap of nostalgia. This album contained the "Dust in the Wind" game, where players must run through maze after maze, trying to get to the exit before the Grim Reaper turns them into dust, that later is "blown by the wind" off the screen. Paul McCartney and Co. returned to a more classic sound with this offering, but that's not what makes this title significant. What is significant is that the game on this cartridge, "Band on the Run," was based on a song from an earlier album. Rush's foray into interactive 8-tracks is unique in that the game had nothing to do with the album. Instead of a game based on the hit songs like "Freewill" or "Jacob's Ladder," the band gave us "Geddy's Lee's Pancake Canoe," where the player is Geddy Lee, riding a pancake canoe down a syrup creek, trying to get the best time while avoiding forks and butter pats downstream. This double-ender gave Atari fans "Take the Long Way Home." On each level, the player had to find the absolute longest way through the maze, or else the level restarted. Most people never found the way out of Level 1. The man who gave us Dolly Parton duets and crispy fried chicken also gave us "The Gambler." Unlike other poker video games, this one was more limited in its options. Once the player was given his hand, he had to know when to hold them and know when to fold them. Once the hand was over, he had to know when to walk away and know when to run. This continued until the player chose incorrectly, got shot, and had the other poker players dance on his grave.